Analysis and Design of many turbine components and gear analysis for life limiting components of the KHP T700/701K turbine. FEA and iterative analysis leading to system improvements. Description of analysis and design effort for OEM Power Turbine manufacturer. Designed a slave exhaust system to be used in an aeromechanics survey test of a turbine gas generator core for a major turbine OEM. The system comprises state-of-the-art monocrystal high temperature vane alloys and aerospace alloy machined castings and fabrications. Peregrine also managed the procurement and assembly of the dedicated test system. Completed the mission transient finite element stress analysis of GE Aircraft Engines’ CT7-8 Turboshaft Compressor rotor for FAA bulletin life certification. 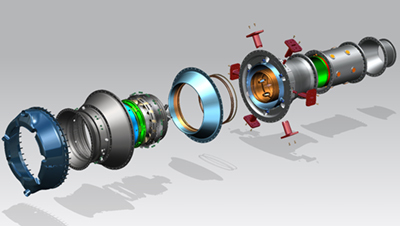 Analyzed and rapidly iterated design of the High Pressure Turbine Shaft for GE Aircraft Engines’ CF34-8C Turbofan engine. Performed Finite Element Analysis (FEA) of bolted joint, conducting low cycle fatigue life analysis of GE Aircraft Engines’ F414 High Pressure Turbine Rotor. This engine powers the Navy’s SuperHornet F-18 E/F. Developed for the U S Air Force under the Engine Rotor Life Enhancement Program (ERLE) as an SBIR effort, Peregrine Consulting designed and delivered two phases of automated life cycle analysis software. 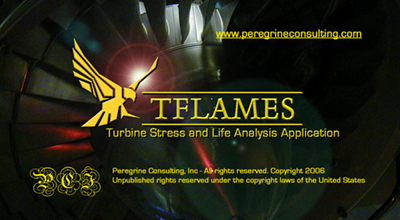 This software program is known as Turbine Field Life Analysis Multi-physics Engine Simulation (TFLAMES). for the US Air. 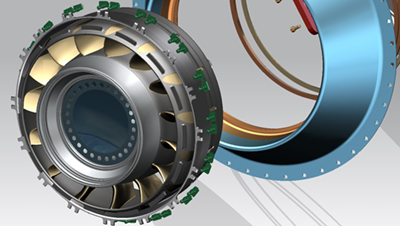 It is a physics-based, non-linear tool employing a 3D finite element core that is specifically designed to calculate the stresses and lives of critical rotating parts in turbine engines, especially for as-flown mission conditions. Developed for the U.S. Navy. The design includes deployable fins and wings as well as folding pusher prop blades powered by a gun hardened wankel motor. Extensive 3D finite element analysis was required for modal and stress analysis of the system at launch where accelerations reached 15,000 G's. Developed for the U.S. Army to autonomously seek and destroy enemy armored vehicles. The device is an auto-gyrating helicopter with cyclic control for maneuvering controlled by an onboard computer and target sensors. Conducted nonlinear finite element analyses of a cast aluminum vacuum transfer chamber for Tokyo Electron. Conducted several design iterations of the chamber for significant improvements in deflection under vacuum. Correlation to test data proved design changes to be exceptional. Conducted plastic strain finite element analysis of an ultrasonically welded polypropylene monofilament for Axya Medical as part of a novel application of ultrasonic welding to suture technology. Designed a flight simulator motion base for Instron Corp. to be used for consumer entertainment. Finite element analysis of the welded structure was employed throughout to ensure adequate safety factors and minimize weight. Our work reduced part count by about 50% and as a result reduced product cost. The use of FEA allowed rapid design iteration and optimization of the hydraulically actuated system. Conducted finite element analysis of a 4 bar linkage for backplane card insertion in a high speed switcher assembly for Excel Corporation. 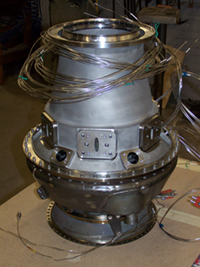 Enhanced designed of Z-drive cast aluminum components for cost-reduction of Brooks Automation wafer handling equipment used in the semiconductor manufacturing industry.